DNA testing is now mandatory. All breeding dogs have to undergo DNA testing. Failure to DNA test will result in the produced litter not being registered until DNA testing has been completed. DNA testing is a safe, non-invasive cheek swab taken by yourself and sent to a special laboratory. The benefits of DNA testing are numerous. One of our main reasons for starting this DNA testing scheme is to prove parentage. Provided that both parents have been DNA profiled, the parentage of all future puppies can be proved. This will cut down on the number of people breeding any mixture of dogs and claiming they are pure Tamaskan for monetary gain. We recommend puppy purchasers only buy from DNA tested parents. DNA profiling can also help in the future if any genetic disorder is found. We should be able to trace the problem, which will help us in eradicating the problem. Our DNA testing is being undertaken by MMI Genomics. The final profile is provided to you in an attractive certificate that proudly displays your dog�s unique genetic identity. 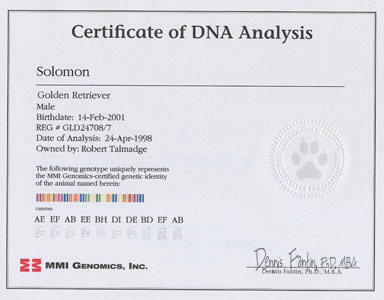 ALWAYS ask for proof of DNA profiling, if your breeder fails to provide this certificate (or the certificate is from another company other than MMI) then chances are they are not pure, registered Tamaskan. DNA profiling can be done from the day of birth and some breeders may choose to have the whole litter DNA profiled although at the moment DNA testing is only mandatory for breeding dogs. EMAIL for more information or to requested a DNA testing pack.